GPS, 2-way communicator and emergency beacon all in one. Preloaded with topo maps of North America and equipped with a digital compass, barometric altimeter and accelerometer, the inReach Explorer+ helps you get where you want to go. It also lets you send and receive text messages and emails anywhere on the planet. Location data is sent with each message, so your friends and family can follow your adventures. A dedicated SOS button lets you call for help, no matter where you are. Use the free Earthmate® app to pair the Explorer+ with your smartphone to review trip information and access your phone’s contacts for easier messaging. Preloaded with a 1:24k map of North America data of the U.S. and Canada. Mexico also is included at a 1:125k scale. Digital compass, barometric altimeter and accelerometer. Housing is water-resistant and dustproof with an easy-to-read colour display. Uses Iridium’s constellation of 66 satellites for coverage of the earth's surface. Messages are buffered for up to a day. 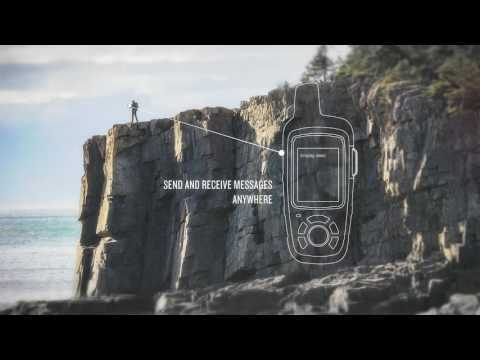 Iridium’s worldwide coverage lets you send texts and emails from anywhere. How many you send and how detailed they are depends on the plan level you choose. Virtual keyboard makes it easier to compose texts and emails. Stores predefined text messages to send as needed. GPS tracking feature allows friends and family to follow your progress via a personalized MapShare® page. World coverage SOS feature gives you a confirmation message from the GEOS rescue centre. 2-way texting allows you to stay in contact with rescue personnel. GEOS emergency response coordination center has 24/7/365 staffing. Messages have your GPS location embedded for faster finding in emergencies. High-sensitivity GPS chip provides position accuracy to within 5 metres. Optional weather forecasting service sends weather data for your location, a specific waypoint or a GPS coordinate directly to your inReach, paired smartphone or tablet. Connects via Bluetooth to smartphones/tablets running the free Earthmate app, available on iOS (requires iOS 9.2 or later) and Android (requires 4.1 or later). Allows you to download maps and nautical charts, enabling detailed mapping and easier messaging – directly through your contacts. Free Explore® web app lets you manage contacts, plan trips, store tracking data and more. Requires a separate satellite plan to activate. Canadian monthly plans are available, as well as seasonal hibernation options that allow you to pay a minimal fee during months when you are not using the device. Allows you to test the unit. GPS coordinates are sent in each SOS message. Allows you to send a 'check-in' message to let people know you are safe. Lets you know that your message was received.